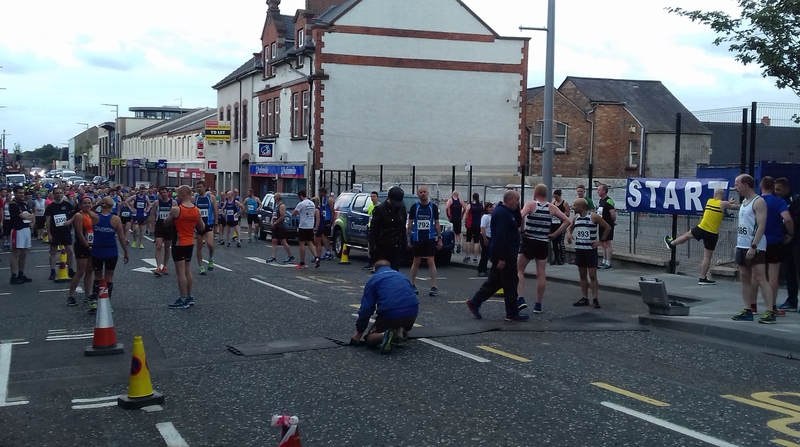 So tonight I tackled the Fairhill 5, which is basically a five-mile race around my own town centre organised by my running club. My local race, in other words. I’ve never done well in it. Two years ago, when I’d first started running, I took part in 2.5 mile fun run event, damaged my knees and didn’t run again until August that year. In 2016 the heat was horrendous, I really struggled on the night and finished second last in what has gone on to be my slowest ever time over five miles. And this year didn’t bode well either. I’ve been suffering from the dreaded lurgy for the best part of a week. I haven’t been out for a run since parkrun on Saturday morning and have been feeling generally yuck day and night. So I wasn’t exactly full of confidence going into tonight’s race. I’d spent a decent part of the day in bed, a mixture of feeling sorry for myself and trying to conserve as much energy as possible. And, I’ll be brutally honest here, I was dreading tonight’s race much more than anything I have done for a long time, even moreso than my two marathon’s! Why? Because I didn’t want to let myself down on my own doorstep. I didn’t want to bring shame on the club shirt. The pressure was all self inflicted but, believe me, it felt real. Even walking up to registration I was in two minds whether I’d actually compete. But, I figured, I’ll give it a go, maybe the fresh air might clear me up and maybe chatting to people might give me a wee bit of boost. And that’s exactly what happened. I managed to forget about the lurgy for a while and started to feel better. Then I got word of another little bonus … because of a recent fire in the town centre a small part of the normal route was inaccessible so there had to be a detour around the affected area and, because of that, the start was moved almost to the top of the only real ‘climb’ of note on the route. I had been dreading that because it comes upon you almost from the start, just at the point I’d normally be sorting my breathing out, but now it wouldn’t be an issue. Starting the race, I was concerned about how I’d cope. Would my legs work? Would my breathing work? Would my head even work, or would it object as strong as it possibly could and make the rest of the run a living nightmare? Maybe I should start off slowly and take it from there. That’d be the sensible thing, wouldn’t it? Hmmm, my first mile was my third fastest ever. So much for being sensible. But I felt ok with it. My body didn’t convulse in horror at being forced to, well, do something. But I knew I had to slow it down so, spotting the first water station after 2km I decided that’d be a good place to take a drink, regroup and settle into a pace more suited to what I’m used to. However, this was still a race, and I had definite target in mind so I kept pushing myself a little. It helped massively that this was organised by my own club so, as a result, I knew almost every marshal and every helper. This definitely kept me going. I mean, I couldn’t walk in front of them and show myself up! Some of them were shouting encouragement, dancing for me, rattling their tambourines, throwing water at me and threatening to stick a rather sizeable umbrella where the sun doesn’t shine if I didn’t get a move on!!!! Thanks ladies! In fact, the support was superb throughout. It really helps being a member of the club because you knew someone at every turn, a quick word with them as you went past was a real tonic. It also helped that I fell in with a couple of other runners at my pace. We chatted with and cajoled each other, which came in handy when the going got tough. I’ll be honest, I didn’t feel 100% but, having said that, I never felt as if I’d really struggled either. On another night, if I was feeling better, I could have performed a lot better. That said, I achieved my target of finishing inside the hour, so I’m happy with that. Without being ill I would have loved to have gone hard for a pb but I lowered my expectations given how I was feeling. I was also seven minutes faster than last year, so I’ve nothing really to grumble about. I’ve exorcised my demons with this event. Bring on next year!